Stabila LAX 50 projects crossed horizontal and vertical lines in a matter of seconds - both perfectly levelled. Ready for all internal work. The result - long, easily visible horizontal and vertical laser lines at right angles to each other which make setting-out easy. For the installation of built-in furniture, laying tiles, wall-papering and all installation work. Setting out without a single pencil mark. That's clean working! The main attraction - the combined tripod / telescopic leg kit. Unscrew the tripod legs and screw together to form the telescopic leg - fit the LAX 50 to the leg - and measure! 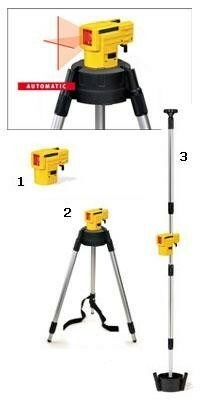 The tripod covers a working height of of 0.6-1m. The telescopic leg can be jammed inbetween floor and ceiling heights of up to 2.75m. If the LAX 50 is placed on the ground, its working height is 7cm. Its versatility makes the Stabila LAX 50 a regular partner for all occasions. The LAX 50 is accurate even when used by just one person - change location quickly. The clever tripod-telescopic leg combination makes the LAX 50 a superb all-round laser.